This entry was posted in Indonesia and tagged Indonesia. Bookmark the permalink. That mascot strikes me more as a voter hunting Van Helsing, but that is just me. 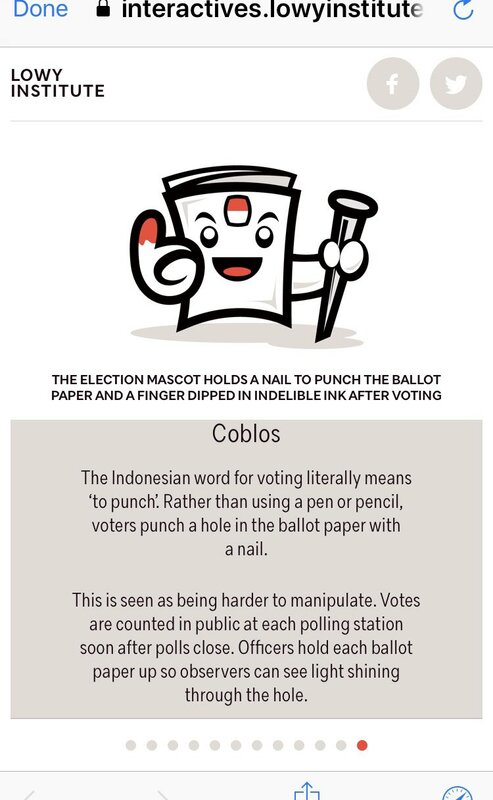 The mascot is fun, but not as much as the superhero themed polling booth in Bali. Oh, yeah. That is good. Prabowo. the defeated candidate, has claimed the relation was rigged and that he is the legitimate president. He took the same line at the last election, which he also lost. Articles in the Indonesian and Australian press have both compared this behaviour to Trump. I wonder, if Trump should adopt the same tactic in 2020 will anyone in the US press call it doing a Prabowo.